Perfect for gifting or for creating an elegant mood during the day or evening, this beautiful collection by Fringe Studio is sure to please. The set of candles please with their sweet fragrances and floral motifs and are hand poured into printed glass. 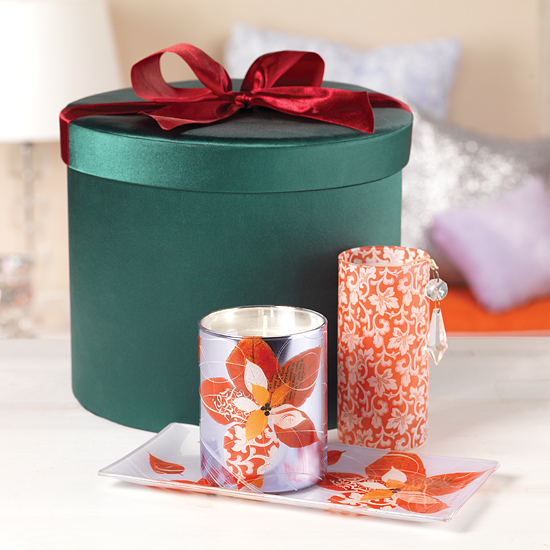 The dazzling red leaf candle with decorative crystal bead has a currant & cassis scent while the candle showcases an exquisite metallic foil floral motif and a vanilla sugar cookie scent. Please note we are not offering this in our satin hatbox. .